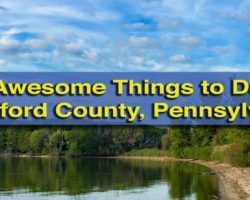 I’ve been to a lot of state parks in Pennsylvania, and one of my favorites has been Oil Creek State Park in Venango County. 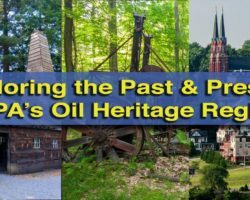 True, Oil Creek might not be the most beautiful of Pennsylvania’s State Parks, but it is quite lovely, and the region’s amazing history propels this park to must-visit status. The Petroleum Center bank’s steps are the only remnant of what was once a bustling oil boom town. Truthfully, I often give self-guided walking trails a pass. 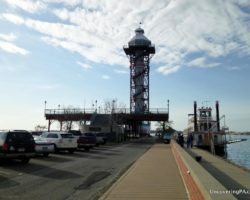 However, the three in Oil Creek State Park are really quite interesting and provide a glimpse into the boom and bust towns that sprung up on the land that is now the park. The easiest to visit is the Petroleum Center Trail next to the park office. The dozen interpretive signs take you through the heart of Petroleum Center, a boom town that lasted just seven years (1866-1873), but saw the creation of many millionaires (and even more bankruptcies), a visit from President Ulysses S. Grant, and was said to be the “Sodom and Gomorrah” of the Oil Region. During the life of the town, there were few permanent structures, and buildings were torn down as oil was found. In fact, the only evidence of this former town that can still be seen is the front steps of the bank. 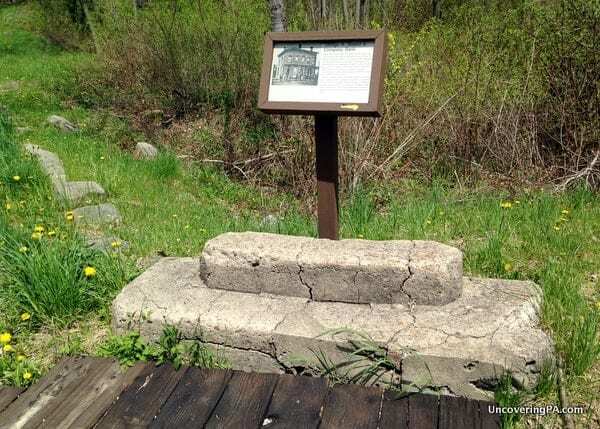 There is also a fascinating self-guided interpretive trail at Blood Farm. This one requires a bit of easy trail walking, and has several buildings set up with old oil drilling equipment. Miller Falls is one of at least four waterfalls in Oil Creek State Park. Oil Creek State Park is home to at least four waterfalls, but I’ve been told there are more. While these waterfalls might not be as impressive as some of the waterfalls in eastern Pennsylvania, they are still quite scenic. During my visit, I had a chance to check out Miller Falls, which is the easiest waterfall to reach in the park. 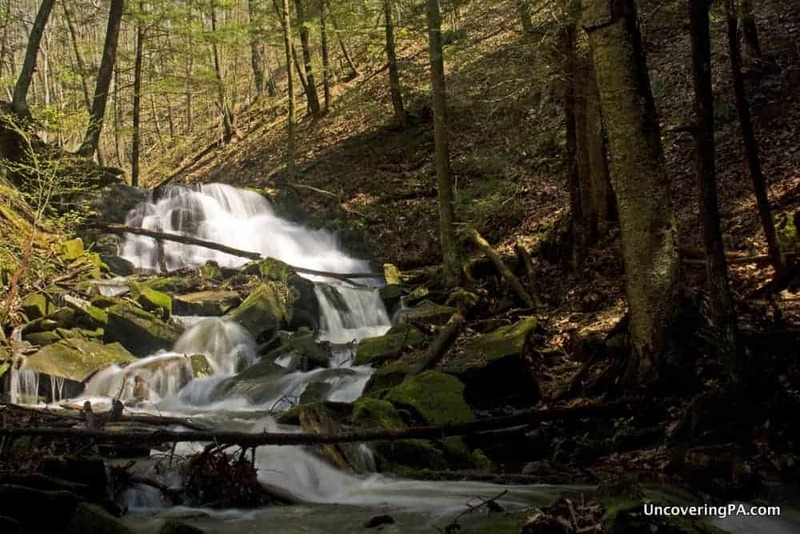 Located just a few hundred yards off Miller Farm Road along a short spur of the Gerard Trail, Miller Falls drops around 15 feet along a scenic stream. There is rusting old oil equipment near the waterfall, which makes it even more interesting. Other waterfalls that can be found on the park map include Pioneer Falls, Plum Dungeon Falls, and Boughton Falls. A replica of the Drake Well can be found on the grounds of the Drake Well Museum. Technically, the Drake Well Museum sits just outside the boundaries of Oil Creek State Park. However, since it is contiguous with the park, and the driving point of the park’s history, I felt it was worth including. 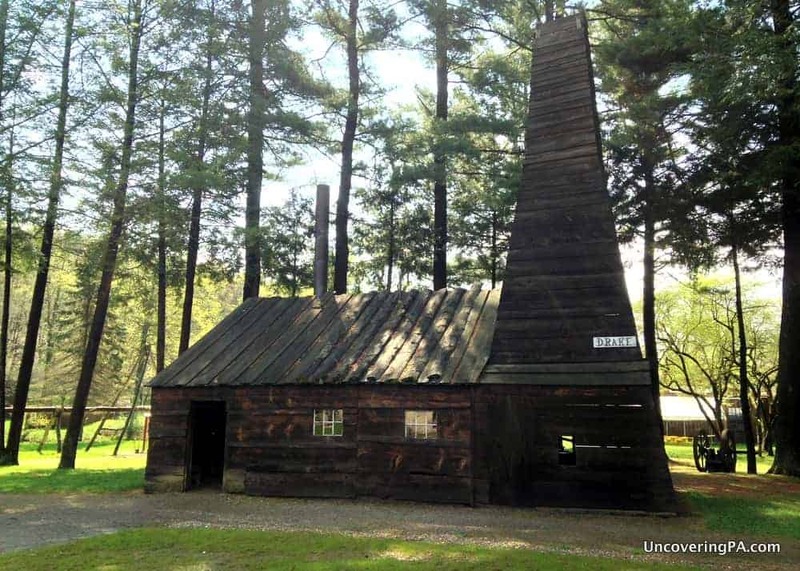 The Drake Well Museum tells the story of Edwin Drake and the world’s first commercially-dug oil well, which occurred on the museum’s property. This well set off a string of events that first shaped the Oil Creek Valley, and, over the last century and a half, has shaped the entire world. Today, a replica of the well can be found, along with old oil drilling equipment. The site also has a fantastic museum that tells about the discovery, the oil industry, and how oil has shaped our world. 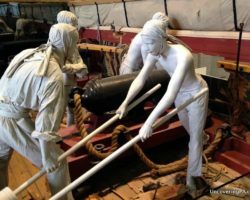 For more information, check out my full write up on the Drake Well Museum. Rusty oil equipment along the Gerard Trail in Oil Creek State Park. 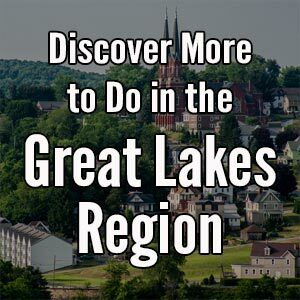 There are 52 miles of hiking trails in Oil Creek State Park, but one of the most popular trails is the 36-mile Gerard Trail. The trail meanders through the park along both sides of Oil Creek. Those looking to hike the whole trail can take advantage of two overnight shelters, the only places where camping is allowed in the park. 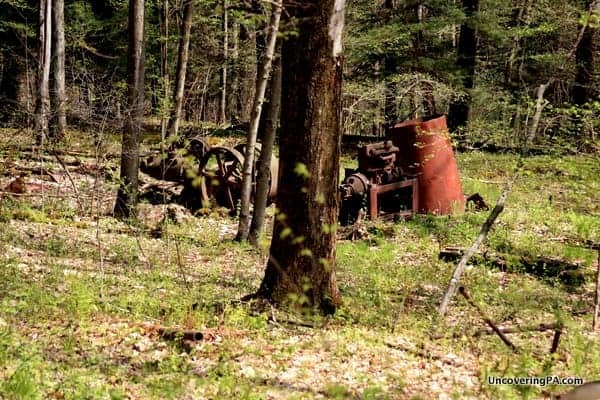 Along the trail, you’ll happen upon rusty equipment from the region’s oil boom. This equipment testifies to a time when people came by the thousands to try and secure their fortunes in the oil industry. The Gerard Trail can also be hiked in shorter portions, as many parts of it pass near the park’s roads. Riding through Oil Creek State Park on the Oil Creek and Titusville Railroad is a relaxing way to enjoy the park. For those looking for a more leisurely trip through Oil Creek State Park, there are several options for travel along the creek. A nearly 10-mile bike trail travels along the banks of the creek and makes for a fantastic trail for those looking to explore the beauty of the park on two wheels. The trail passes several historic sites and comes close to some of the park’s waterfalls, for those looking for short diversions along the trail. Another option to see the creek is by kayak or canoe. While Oil Creek is shallow for much of the year, it is a great creek for all skill levels during the spring and early summer. Kayaking down the creek is a great way to experience the park from a unique angle and enjoy the beauty of this historic waterway. 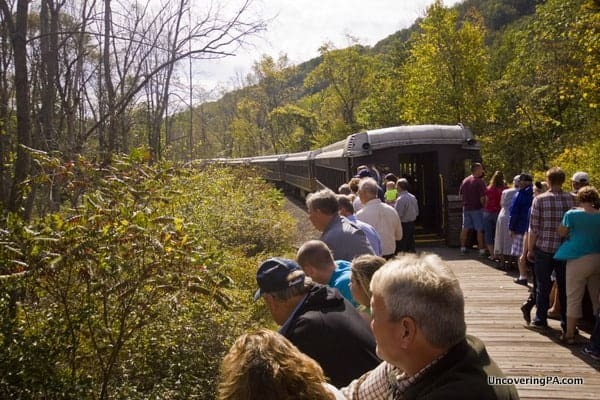 For those looking for an even more relaxing way to see the gorge, the Oil Creek and Titusville Railroad runs excursion trains along the creek from June through October. Departing from Titusville, the train passes through the gorge, making several stops along the way. 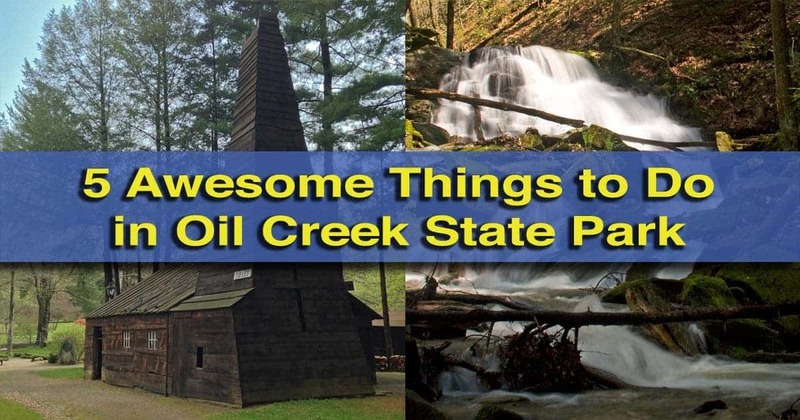 No matter what you do in Oil Creek State Park, however, you are sure to see what makes this beautiful and historic destination so special. 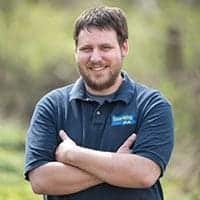 Thanks for the write up and promoting Oil Creek State Park. I grew up only a couple miles away, I’ve spent my entire life there. I am somewhat ashamed to say that, despite living only 15 miles away, I never spent much time at Oil Creek until last year. 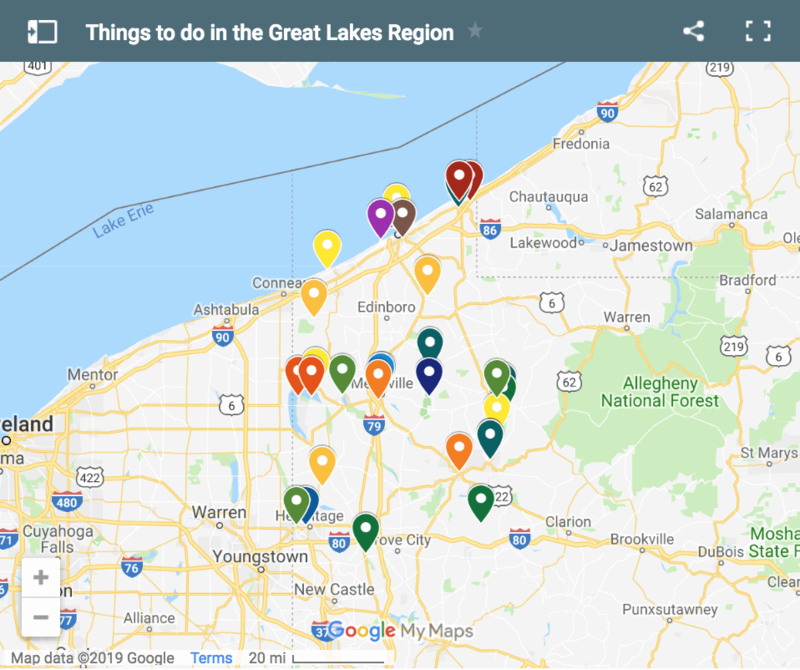 I found there to be quite a few great outdoor opportunities there. My introduction to backpacking was there last fall. Definitely worth your time and effort to visit. I LOVE Oil Creek. It is home to the OC100, an amazing trail race held in early October. It is a slice of heaven! Don’t forget winter! Oil Creek has 12 miles of groomed and tracked Cross Country Ski trails! You can kayak from drake well and take the train back from oil creek for a couple extra bucks.